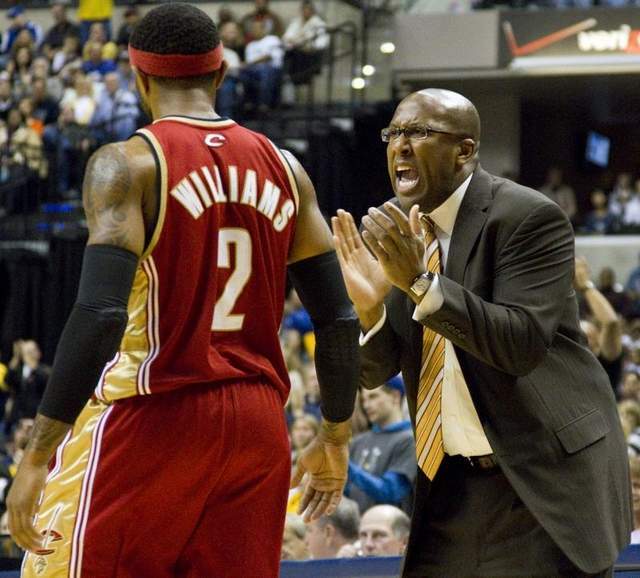 The Cleveland Cavaliers are reportedly planning to re-hire Mike Brown as coach, three years after they fired him. Brown and the Cavs have reached a “handshake agreement” according to The Beacon Journal and the hiring could become official as early as Wednesday. We certainly didn’t see that one coming. Of course, he also did that with LeBron James on the roster and James won’t be rejoining Brown in Cleveland (at least not right away). Brown comes back to a Cavs team with plenty of new faces – only Anderson Varajeo remains from the roster of Brown’s last team in 2009-10. The Cavs are also a more-balanced team and still have a superstar in Kyrie Irving – the first real point guard that Brown will have coached in Wine and Gold. When the Cavs fired Byron Scott last week general manager Chris Grant said he wanted a coach who emphasized defense and Brown certainly does that. He is also reportedly the only coach the Cavs formally spoke to, although ESPN reported that the team “reached out” to Phil Jackson, but Jackson was not interested. According to a story on NBA.com, the Cavs and Brown are still working out the details of his contract, with Brown reportedly wanting five years but the Cavs offering just four. Brown also reportedly needs to work the offset he has with the Los Angeles Lakers, who still owe Brown $10 million after firing him just five games into this past season. There are certainly going to be Cavs fans who will not like the move because they blame Brown for everything that went wrong with the Cavs – especially in the Eastern Conference Finals in 2009 and the second-round of the playoffs in 2010. But that overlooks the fact that the Magic hit some ridiculous shots (and were hopped up on performance-enhancing drugs) in 2009 and that James flat out quit in 2010. And with Jackson not coming to town, there are not a lot of coaches with a winning resume out there for the Cavs to hire (unless you thing Doug Collins or a college coach are the answer; just ask Charlotte how well the college route worked for them). As we discussed with Sean McLaughlin on Twitter today, it doesn’t matter if the Brown hiring doesn’t create buzz. We’re tired of buzz; we’re getting old and all we want to do is see a Cleveland team win. We won’t know for a while if the Cavs finally have the right mix of coach and players, but hiring Brown doesn’t preclude the Cavs from winning. And if nothing else, this move certainly has people talking about the team and that’s an impressive feat just two days before the NFL Draft.